Let's be honest, we spend most of our days in a seated position. We're at our desk, in the car or bus, sitting to eat a meal, sitting to relax while watching Netflix or sitting for coffee with a friend. Our posture and the way we sit is important, sitting for too long with poor posture can lead to neck and back pain and no one wants that. 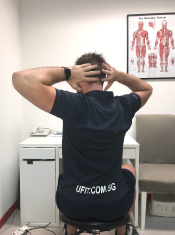 The UFIT team comprising Dave Lee (Physiotherapist at UFIT Clinic Orchard) and Simon Porter (Head of UFIT Performance) have worked closely with the team at Visa Singapore to perform desk assessment demonstrations and provided education on correct sitting posture and desk set-ups to stay pain free. Additionally, they have also shown the different stretches and exercises that are good to do in the presence of pain and discomfort. On top of all of the above, they have also shared tips and tricks to stay fit and healthy while getting work done. 1. Squats with Resistance Band – Place a loop of resistance band around your knees with your feet shoulder width apart. Step a little wider with one foot so the band is taut around your knees. Try to squat on the spot while maintaining the distance between your knees. Avoid allowing the band to pull your knees in. Initially aim for one minute of squats and reduce or increase the duration depending on difficulty. 2. Crab Walk – Place the resistance band around your ankles and go into a half squat position. Walk three steps one way and three steps the other. Use your legs/hips to power the movement and avoid rocking your upper body. Keep the distance equal between your knees. To increase the difficulty of the exercise, place the band around your feet. Conversely, if you would like to make it easier, move the band above your knees. Repeat for a total of one minute. Pause during the minute if you need to. 3. Lumbar Spine Rotation - This exercise helps increase movement in your lower back. Have your arms out in a ‘T’ position, knees bent to 90 degrees and your lower legs hovering in the air. Imagine the top half of your spine and arms are stuck down with glue and are not allowed to move. Allow your legs to fall to one side as your lower spine rotates and then repeat in the other direction. Aim for 10 in each direction. 4. Modified Press-Up - Loop the resistance bands around your arms and then move them out into a press up position to feel the resistance of the band. Perform the press-ups for one minute either from your knees or feet depending on how difficult you wish to make the exercise. Aim for a minute and pause if needed. 5. Clam – Begin by lying on your side with your knees bent and your head resting on your arm. Loop the resistance band around your knees. Hover your feet slightly in the air. Lift the top knee away from the bottom knee without moving your upper body or spine. Slowly lower your leg. Aim for 30 seconds on each side. 6. Cervical (Neck) Retraction - Most office workers tend to have a “forward head posture” with the ear in front of the shoulder. Cervical retractions are aimed at mobilizing or moving the joints of the cervical spine to activate the deeper neck muscles. Bring your chin back (as if making a double chin) and return to the starting position, unfortunately, it is never an attractive exercise. 7. Thoracic (Mid Back Extension) - Sit upright in a good posture. Have your fingertips touching your shoulders and your elbows level with your shoulders. Try to arch backwards through the middle part of your spine rather than your lower back. 8. Thoracic Rotation – Place your hands on top of your head. Keeping your pelvis and neck still, rotate to one side and then the other. Aim to move from the spine rather than from the shoulders or pelvis/hips. 9. Thoracic Side Flexion – Starting with the hands behind the head, lean to one side bending from the middle and then repeat for the other side. 10. Glute Activation – Office workers tend to have poor glute activation due to their sitting positions. Place a resistance band around the knees and push your kneed out to the side against the band’s resistance. Ensure that your feet are kept together. So give these exercises a try, your back, neck and hips will thank you after being in a chair all day! 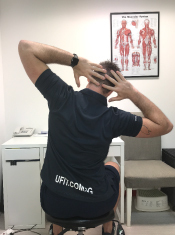 With a love for sport and exercise from an early age, Dave is a UK qualified physiotherapist from Cardiff University with a previous degree in Sport Science. Prior to working as a medical professional Dave spent six years working in the health and fitness industry. He is also an avid athlete with experience in football, marathons, cycling sportives, and triathlons.